The profiLINE™ is a flat coil metal detector for Film or Web industry and helps ensure quality in films and non-woven textiles. The metal detector can protect calendar rollers and removal of needles in film. Also can ensure metal-free food-grade plastic film. These Flat Coil Detectors prevent costly repairs and production downtime. Units are self-monitoring for added reliability. 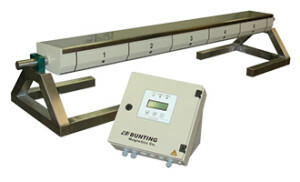 The ProfiLine features advanced circuitry which reduces false signals and product waste. • Extremely low profile with superior sensitivity on coil surfaces. • 12 inch side segments for pinpoint accuracy. • Available up to 40 feet wide. • 04 Software enables you to pinpoint contaminated zones. Multi-port output to trigger other processing equipment. • 05 Software delivers a single overall control zone.